At IndoAgri, our goal is to ensure that all our employees return home safely everyday. To achieve this goal, we have a constant focus on maintaining a safety culture. In 2017, no operations or suppliers were identified where collective bargaining, or freedom from forced or child labour, are at significant risk. Our commitment to responsible employment is found in IndoAgri's Sustainable Palm Oil Policy . This, along with our Values, drives us to respect labour rights of all, to prohibit forced and child labour, to protect freedom of association and collective bargaining, and to promote diversity and equal employment, for example. The well-being of our employees is crucial to our business productivity. Through our collaboration with local governments and hospitals, we provide free access to essential medical support, facilities and infrastructure for the people living on our estates. We operated 192 clinics on our plantations in 2017. Medical facilities. Clinics and first aid posts are provided on every estate for workers and their families. Community Health Centres ('Posyandu') are also available in the wider community for maternal and infant health care. 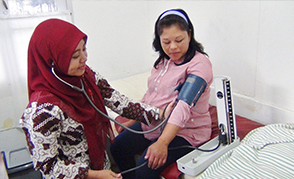 We also operate or sponsor 206 Posyandu, supported by 269 midwives/nurses and 50 doctors. IndoAgri operates programmes to support education, health, infrastructure, micro-enterprise, farmer training, culture, and humanitarian relief. As an agricultural business with operations in rural Indonesia, our business plays a crucial role in helping improve the economic income and livelihoods of the rural Indonesian communities. The outcome we would like to achieve are improved livelihoods and increased resilence for our farmers and suppliers, communities and families. Besides formal employment, we actively collaborate with the local communities through our Solidarity Programme which aims to improve the quality of life in our nucleus and plasma estates. We have initiated many community development activities through our Solidarity Programme, which seeks to improve the quality of life in the estates through capacity building, education and financial support. To tailor our community programmes to the needs of each community and estate, we have started conducting Social Impact assessments through an external party at each of our estates and factories. We consider factors such as the cultural background, literacy rate, living condition and economic situation of the local community before tailoring a programme that suits the developmental need. Cleft Lip Surgery Program. 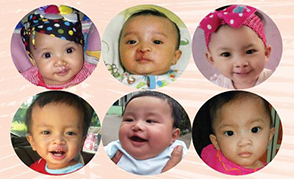 Our flagship cleft lip programme is a vital contribution to society in Indonesia. Few people know the depth of action by our team: from searching for cases, pre-operation family counselling, surgery and post-operative care or speech therapy. The team delivered 117 operations on 102 patients in 2017 (a total of 254 operations on 230 patients since 2014). Parents or legal guardians of these children can approach the estate management or Dina (+6281219678831) for assistance. The public is encouraged to share the programme with the parents and legal guardians of children with cleft palates. Details of the programme are available at www.simp.co.id/CSR/CSR.aspx.